There are so many little things in history that have become the stuff of legends. Some of these are because we have no concrete proof or explanations. Some are because generations of stories around an event give a Chinese whispers effect - until we have no idea what is fact and what is fiction. Sometimes, we really don't know, and until new evidence crops up, we can only hypothesize. Did the great war of the Mahabharata really happen? What do we know about the Harappan script and language? What really happened to Mohenjo-Daro? What is the truth about the legend of Dwarka? 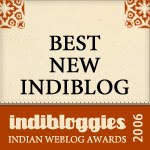 What is the real story behind the Vikramaditya of the Vikram and Vetal stories? 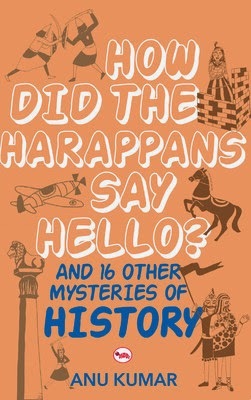 ... Anu Kumar has taken 17 such deliciously mysterious points in history, and has tried to discuss various pieces of evidence we might have about them - often coming to no particular conclusion, but leaving things open to the reader's speculation. In doing this, however, she proves one thing - that one cannot say with certainty that the history we have traditionally learnt might always be correct, that there can be so much more to it that we might not know. This was a book I could not let go until I had finished it. I was piqued enough by many of the chapters to do a little of my own research online, and that, I think, is the success of this book - to make the reader think, and want to explore for themselves. Which is what all good historians would approve of. A book to be read through, or just dipped into, that is sure to stoke the interest of children reading it, introducing history as it should be. Where did the mythical Saraswati flow, which is clearly described as a life-giving force in the vedas? (The Sanskrit word for life is jivana, which also means water.) How did historical events shape the geography of the area, leading to the drying up and disappearance of the river, also causing the Thar desert? What is the truth about the Aryans and Dravidians? If the Aryans were supposed to have reached India only around 1500 BCE, what, then, accounts for the genetic evidence that is proof that the mix of genes between the Indo-Aryans (part of the 2nd wave of humans migrating from Africa) and indigenous Dravidians (who are believed to have come to the subcontinent as the first wave of humans who came out of Africa) happened around 10,000 years ago? What are the primordial memories that led to the myth of the flood? What are the historical and cultural roots of our literature: the Ramayana and the Mahabharata of the Vedic tradition, Silapaddikaram and Manimekhalai of the Sangam tradition, Vatsyayana's Kamasutra, Kalidasa's Meghadoota and Abhjnanashakuntalam, Kalhana's Rajatarangini, Bana's Harshcharita, and the later Ain-i-Akbari by Abu Fazl? What do we learn about their contemporary societies from these books? What is the mystery of the missing lions in Harappan artifacts, even as it looms large in those of almost all subsequent imperial edicts, the most well known of which are those on the Ashoka pillars? Did ancient Indians really trade with the Mesopotamians? What is the history of ancient Indian trade routes, and why did we, at some point of time, completely stop it, even to the extent of making it a sin to travel overseas? And this despite a long coastline, with many natural ports? What is the history of the influx of various religions - whether by refugees, traders, colonisers, or invaders? How did all these affect the people here differently? What is the significance of strategically positioned cities and towns of ancient India, many of which still are important places? 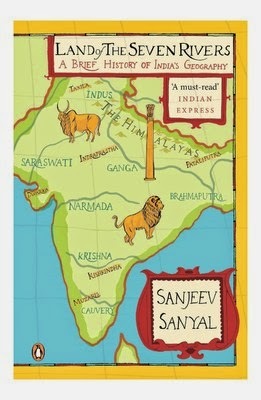 These, and many more questions are discussed by the author, Sanjeev Sanyal, in an extraordinary book on how the geography of a region might affect its history, and vice versa. The author clearly states in many cases, that one can only surmise, and that more evidence is required to be sure of something that we do not yet know much about, and that the important thing is to keep the discussion open ended. A lucidly written, wonderful book for budding YA aficionados of history.